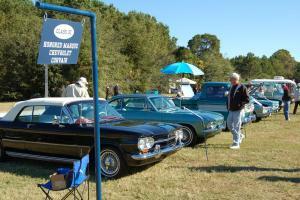 The Central Florida Corvair Club held their annual fall Corvair Affair in Saint Augustine, Florida November 4-6, 2011. The event included a Friday night welcome meal, valve cover racing, part vendors, car show, autocross, rally, and an awards brunch. There also were many drawings for door prices. Even though the weather was a little on the cool side it stayed dry and a good time was had. The 2011 Corvairs in the Curves autocross was held October third in Anderson, SC at the Anderson Motor Speedway a 3/8 miles paved oval. Recently I had to fix the speedometer in my 2003 Silverado Truck. The estimates from the dealer were way to high. I found out you can get the replacement stepper motors and solder them in yourself for about $30 in materials. I took some photos and video of the repair and posted them online. Follow the link below to see the article. Approximately 30 Corvairs took place in the 2010 Hilton Head Concours and Jamboree honoring the 50th anniversary of the introduction of the Chevrolet Corvair. You can see the photos of the Corvairs at the 2010 Hilton Head Councours. I am at the 2010 CORSA Convention being held in Cedar Rapids, Iowa. I will post photos here as I have time. So far there are photos of the Autocross held in Marshalltown on Sunday. I have now posted photos from Monday and the Concours held on Tuesday. Photos from Wednesday and the Autocross are now posted. Photos from Friday's Car Display are up. Photos of 2010 CORSA Corvair Convention. The 2009 CORSA Convention was held in Jacksonville, Fl on July 13-17. The convention was held at the Wyndham Jacksonville River Walk along side the St John's River. Events included the Concours and car display which was setup along the river. Featured this year was the 1969 model as this was the 40th anniversary of the model year. It was a good but rainy weekend in Raleigh for the 32nd annual Fall Corvair Affair hosted by CORSA/NC. The weekend started with a cruise in Friday night to the local Sonic. About the time that was winding down it started raining. The nights entertainment was a movie in the hospitality room. The Corvair Museum was formed in 1994 to house and display Corvair historical and educational material. Property and income for the museum are solely from donations, primarily from CORSA members. Other individuals and organizations have contributed or provided items on loan to the museum. Exhibits at the museum include vehicles, mechanical displays, literature and artwork.